Perches are an important part of hummingbird habitats, and having perches in your yard will provide not only a resting place for these desirable birds, but also a convenient viewing location for great looks at visiting hummingbirds. The most preferred perches are high to offer good, wide views, and they are in the open so the view is not obstructed by leaves or other branches. A hummingbird will return to its favored perch often, and will even chase other birds away from the perch before settling down again. All hummingbirds will find natural perches in their favorite feeding territories or near nests. The most popular perches are thin, clean branches or twigs, though vines and other spindly growths are also suitable. The bird may perch on the side of the branch or at the very tip, depending on how the branch is oriented, and they will grip it firmly and sway with breezes. 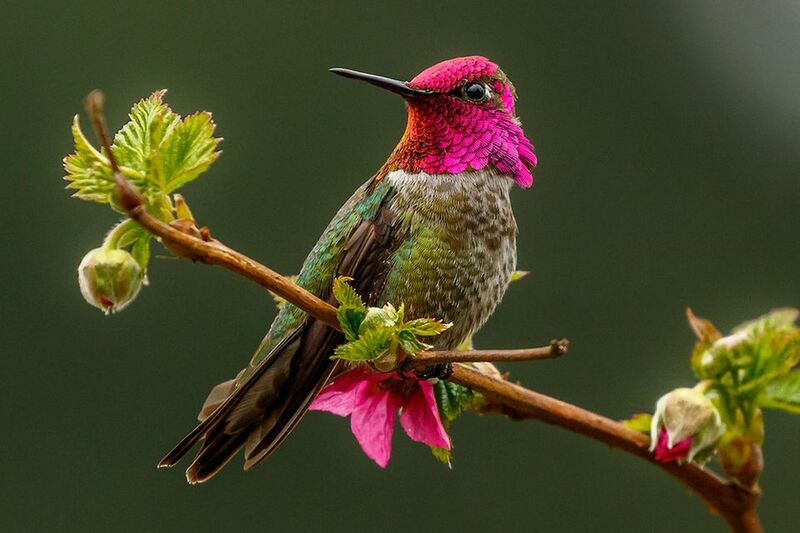 To provide natural hummingbird perches, avoid pruning away every dead branch or new growth, particularly branches or twigs that extend away from the main growth of a plant. Watching where hummingbirds prefer to perch can help you preserve those favored spots, and leaving several perches available at different heights will accommodate more birds' tastes. If your landscaping does not include hummingbird-friendly perches, it's easy to add supplemental perches for the birds to use. Adding small twigs to a brush pile or leaving up a thin clothesline can attract a hummingbird. Similarly, using suitably thick and stable wire to wrap around an existing branch to make a thin offshoot can create an artificial perch hummingbirds will appreciate. Hummingbird accessories such as miniature swings add instant perches to any yard, and decorating these artificial perches with red wire or beads will help draw the birds' interest. Position supplemental perches near hummingbird flowers or feeders, providing several options so birds have a choice depending on what their needs and preferences are. No matter where a perch is situated, be sure there is sufficient space for the bird to see the area nearby and fly freely to make the perch more attractive. Provide a variety of perches at different heights, angles, and both in sun and shade. The birds will use different perches at different times of day, and different hummingbird species have different preferences for the best perches. Position perches so you have a good view of them from unobstructed windows, patios, or decks. Because the birds will return to the same perches frequently, being able to observe them at those perches can be a rewarding part of backyard birding. Consider placing a perch near a water mister so hummingbirds can easily fly through the dampness. This is how these tiny birds prefer to bathe, and they will return to a convenient perch for preening and sunning after their feathers are moistened. Always provide sufficient open space around perches for the birds to feel safe and secure. Not only will a more open perch allow them to be on the lookout for predators, but because hummingbirds cannot walk, it is essential that they have enough room around a perch to launch into flight quickly and easily. There is debate among birders about whether hummingbird feeders are best with or without perches, but birds will use either type of feeder. Providing perches at the feeder or close nearby will give birds a convenient place to rest between feedings, but not all hummingbirds will use perches even if they are available. They may even rest on one hummingbird feeder but prefer to feed at another. Ideally, providing feeders with and without perches simultaneously will not only give birds the option to choose, but will also accommodate more hungry hummingbirds. If you do provide hummingbird feeders with perches, be sure the perches are far enough out from the base of the feeder so birds can easily access the nectar while perched. Monitor the perches regularly to ensure they are not stalked by hummingbird predators to give birds the opportunity for safe, relaxed feeding. Providing perches for hummingbirds is a simple, easy way to get great views of these attractive birds. While hummingbirds may be fast and active in flight, they all come to rest sometime. If you know where that resting spot is, you can enjoy watching the birds more easily.